On Wednesday night, Mamma Mia! 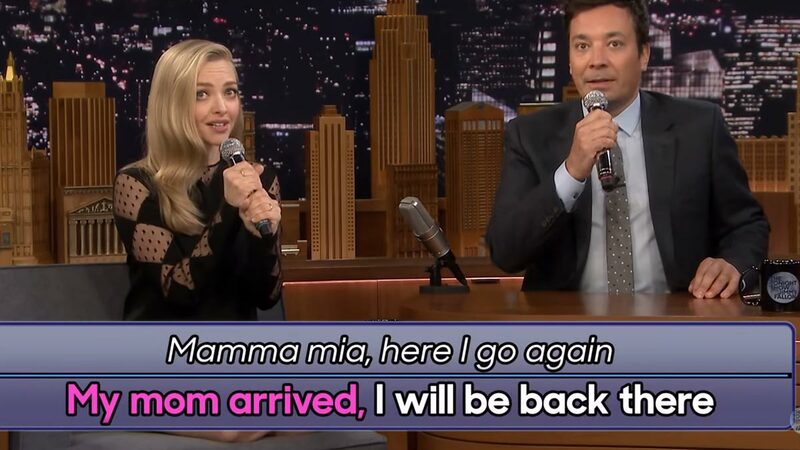 lead Amanda Seyfried dropped by The Tonight Show Starring Jimmy Fallon to do a bit of karaoke. I mean, when you have the opportunity to sing some ABBA classics, you take it! ALWAYS take it. There's a twist though: she and Jimmy sang along to ABBA songs featured in the hit musical: "Dancing Queen," "Take a Chance on Me," and everybody's favorite "Mamma Mia! "—but with the lyrics mangled courtesy of some Google translations. Now OK, you might be thinking, wait, ABBA performed their songs in English. Why do they need to be translated?! Well, because it's a late-night talk show skit, that's why! So, then, Jimmy has translated the songs into a different language via Google Translate, and then back to English: "Dancing Queen," which Amanda sings first up, becomes "Hula Prince." I don't hate it?! And in particular, the last line of the song, "Dig in the dancing queen" translates to, "Now eat the hula prince." Which I don't hate either?! Jimmy then belts out "Take a Chance on Me," which for whatever reason translates to "Steal My Sad Clocks." And the whole thing ends with a duet of "Mamma Mia!" now called "My Mom Arrived." Amanda was on the show promoting Mamma Mia 2: Here We Go Again, which is currently showing in cinemas.